"I think we probably did it on our first two gigs. I think we were writing better stuff - that's the answer. It was always considered an album track. Maybe we had a doubt about it at the time." Suffer Little Children was played live only once that we know of, on October 4th, 1982. It has a haunting quality to the guitar line, which is fairly simple and repetitive compared to some other Marr compositions. I think that it's a good song for beginners to tackle because it sounds just as good slow as it does fast, and you can ramp up the speed when you get the hang of it. 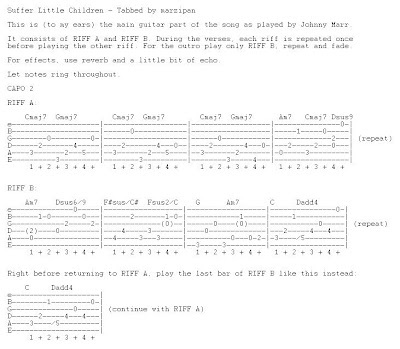 He also passed along a Guitar Pro tab that I have uploaded here. It has a tab of the second and third guitar parts as well! For comparison, here is Daniel Earwicker's take on the song. He uses a pull-off where Marzipan fretted notes on the second chord of the verse. It's different in other ways as well, but both are really great versions. adameater also does a nice acoustic version. It sounds a little different from both of these; I think he might be incorporating some of the second guitar, which is cool. Thanks to Marrzipan for the tab - however, just a quick picky correction. If you listen closely to the studio version you can hear that on Riff B, 2nd verse, third note Johnny actually plays the G string at fret 4, not the B string at fret 2.